Chris DeRose, host of the irreverent podcast, Bitcoin Uncensored, will make an appearance at Bitcoin Wednesday on 7 February, 2018. An avid writer, podcaster and political commentator, he has been involved with cryptocurrency ever since reading Bitcoin’s earliest announcement on Slashdot back in 2010. He hasn’t yet decided what he will talk about. Since he is one of the more controversial speakers in the industry, he may decide to leave it up the audience to bring questions. He told us, “What I talk about is really up to you guys.” Here are some of the questions he has already answered for us. 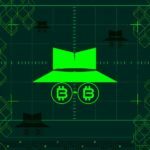 BTC1W: What’s the mission and vision behind Bitcoin Uncensored? Chris DeRose: To understand, and de-risk, the difficult subjects behind blockchain. To find the information that people want censored, and to talk about it. To meme and win. BTC1W: How would you like to be introduced? Chris DeRose: Guided by a strong belief in the Efficient Market Hypothesis, and with an agnostic approach to public policy, Chris’ exploration of the field may best be described as “regrettably reasonable” and “principled irreverence”. Chris DeRose is passionate about the amazing technology of blockchain, and the intersection of finance and computer science, that decentralized technology has brought us. BTC1W: How would you describe your philosophy of life? Chris DeRose: I try to maintain as much irreverence as possible. My goal is to understand the world independent of faith and morality. To understand the places and ideas that most men are afraid to visit. I often consider myself the tour guide at the front of the zoo train, as we navigate through the attractions of our earth’s human wildlife. BTC1W: What impresses you the most and the least about the people in this business? Chris DeRose: The inept pitch leaders that believe their own nonsense about the extraordinary nature of their products are so unimpressive. While I get that they’re needed at this point, I still find them rather repulsive, on average. However, I’m very impressed by the competent coders around the bitcoin space. I’m also very impressed by the men who knowingly run scams to trap the ignorant. Though I don’t want that job, the creativity of those who seek to enrich themselves in the arrogance of others is highly impressive. Oh, and the artists. They’re awesome. BTC1W: What would you like to say to all the new people discovering cryptocurrencies for the first time? Chris DeRose: Dunning Kruger will be your guide. You know everything. There is nothing you can’t do, better than the specialists that came before you. And to prove it, it’s time to start giving away your money. Have you lost your first chunk yet? If not, repeat the last line until it hurts. Are you feeling more humble? Wonderful, now you know how Blockchain works. With your newfound taste for humility, if you enjoy the flavor, then its time to this field seriously. Blockchain is about profiting off the faith of others, through irreverence. Once you understand that, you’re ready to conquer. Meme and win. BTC1W: What’s the funniest mail or call you ever got from a listener? Chris DeRose: Besides the death threats? There have been so many funny emails over the years. The onecoiners were particularly hilarious for a while. I miss them. BTC1W: Any favorite industry celebrity anecdotes? Chris DeRose: Hahahah, most of them are on video. I think my off-camera brush-in with Blythe Masters was my favorite. She was visibly repulsed by my attire, which told me everything I needed to know about her comprehension. I told her why and how her business will fail. She dismissed my advice on account of my presentation. She was too drunk with blockchain Dunning-Kruger juice at the time. The newbs will be scammed by their reverence. Last I checked, she removed the word ‘blockchain’ from digitalasset.com and pivoted to consulting. Sounds like the man in the cat shirt was a harbinger after all. Welcome to blockchain, Blythe Masters. 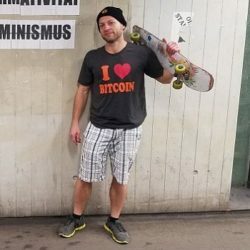 Chris DeRose is the irreverent host of the podcast Bitcoin Uncensored. He is an avid writer, podcaster and political commentator, he has been involved with cryptocurrency ever since reading Bitcoin’s earliest announcement on Slashdot back in 2010.